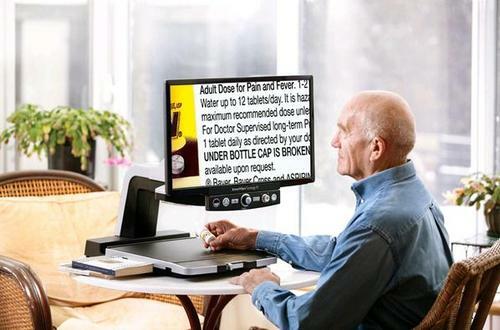 Using a closed circuit television (CCTV) system, this range of electronic reading aids can magnify hand writing or written text, with a broad range of magnification settings. The visual display unit is mounted on a stand and the item to be viewed is placed underneath. Information can be viewed in full colour or black and white.
. Select the size and type of monitor to suit or use an existing computer monitor or TV (to save money).
. The reading table allows for movement in every direction making it simple for any object to be viewed. The large reading depth enables anything to be viewed from a photograph to a thick telephone book.